Nothing beats our plastic coins for teaching young children about money. Coins sport serrated edges and realistic details. Gr. K – 4. 100/pkg. Pack of 100. 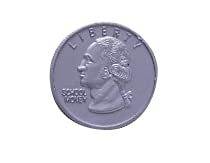 Realistic quarters for learning coin recognition and values. Ideal for teaching basic money handling skills. Molded-in color two-sided coins with serrated edges and details. School Smart hands-on manipulatives are a great value.